The Munchkin Starfinder Kickstarter project had almost 1,300 backers who helped us make the game bigger and better. We ended up creating several expansions and a convenient I Want It All! pledge for the folks who wanted everything. We've already shipped the Kickstarter rewards to our backers, and now we have another exciting announcement: Munchkin Starfinder is coming to your Friendly Local Game Store almost two months ahead of schedule! Retailers will be able to order either Munchkin Starfinder or Munchkin Starfinder I Want It All! through their usual channels. If you want one, definitely pre-order it with your favorite retailer or directly on Warehouse 23! 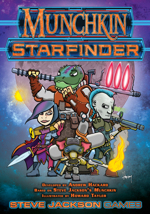 Fans attending Gen Con will be able to get their Munchkin Starfinder games signed by the illustrator, Howard Tayler, on Saturday, August 4 (starting at 7 p.m.), at the Munchkin Tavern. We will have a very few copies of both the base game and I Want It All! available for purchase at the Tavern as well. This is the first time we've hosted Howard at the Tavern and we're excited he's able to join us!